Chris and John Sullivan started building working for their father on weekends and vacations, doing painting, masonry and landscaping. Out of high school, they each went to work for various contractors, both learning the business from the ground up. Eventually, both had become foremen running field crews for their respective Boston employers. At night, they took business classes and in 1982, with two pickup trucks and very little capital, incorporated as Bilt-Rite Construction. They started small, doing remodeling projects on 1-6 unit family homes. Satisfied customers referred more and more business their way and by the mid-’80s they began to bid on public multi-family housing projects, completing their first such project in 1987. Around that time they became the developer for a City of Boston pilot program to build several three-family structures on vacant city owned land. 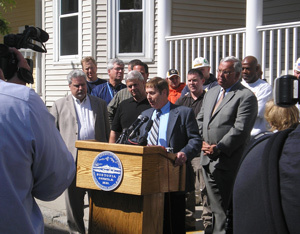 They continued to complete private projects throughout the nineties but added some public projects including several group homes, historic restoration projects, modular housing developments and some work for municipalities like the City of Boston, DCAM, CHA, and the Coast Guard. Over the last ten years they have been concentrating on more complex larger projects with a higher concentration in multi-unit renovation and new construction of residential units. They have also completed numerous municipal buildings and some historic restorations. They like to focus on $5-$25 million projects but regularly complete smaller projects for repeat customers. Chris and John Sullivan meet with Boston Mayor Ray Flynn in 1988 on the site of a rehabilitation project. 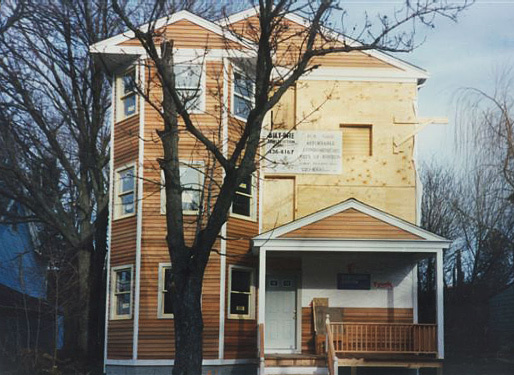 In 1987, Bilt-Rite was named as developer and contractor for three family buildings owned by the city of Boston, part of a pilot program to create affordable housing while cleaning up derelict properties and vacant lots.